Stop hiding your face, and get better skin! by Dana Ramos, author of the best-selling book: The Skin Regime; Boot Camp for Beautiful Skin. With Dr. David Bank, founder of The Center for Dermatology. There are lots of different types of rashes that can crop up on your body, perhaps from an allergic reaction to a product or something you ate, or over-exposure to the sun. Rosacea, unlike an allergic rash or sun rash, is a very common and chronic condition (meaning it may come and go to some degree, but is never completely gone). Rosacea may resemble a deep blush or flushing, and also can appear with small bumps and adult acne as well as broken blood vessels. It shows up as redness and irritation on the face and/or chest, whereas other types of skin rashes can appear anywhere on the body. Rosacea might be mistaken for a sunburn or acne, so you might be choosing the wrong products to treat it. And people who have it often assume—not always correctly--that they have sensitive skin. It is estimated that at least 16 million adults in the United States have some form or rosacea; it is more frequently seen in women, but more severe when a man has it. People with fair skin are more susceptible—particularly those of English, Irish or Scottish descent. 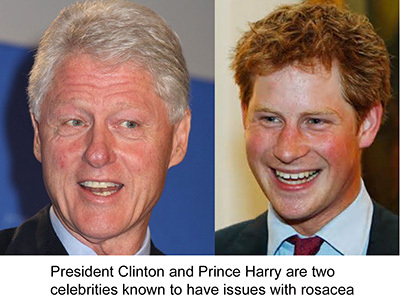 The list of famous people who are known to have rosacea includes former President Bill Clinton and Princess Diana, and Prince Harry appears to have inherited a touch of it as well. Red bumps and small cysts. Symptoms might disappear for weeks or months, just to crop up again. While rosacea cannot be completely cured, it can be managed and controlled with excellent results that can last months or years. Left untreated, rosacea will worsen over time and you can end up with tough-looking skin with a swollen nose, visible broken capillaries and small bumps that resemble acne—mostly on the cheeks and nose, but it can even affect the eyes. “First of all, using sunscreen daily is a must,” Dr. Bank says. “Avoid your triggers, and try to exercise in air-conditioned rooms.” There are non-prescription products that will help cool and calm your skin. “You want to use products for sensitive skin, such as gentle cleansers and moisturizers, and nothing that will cause irritation,” Dr. Bank adds. An excellent gentle cleanser is the Gentle Cleansing Lotion. If you notice flushing, use cold packs to calm down and soothe the skin. Keep your skin cool whenever possible and avoid the triggers that cause flushing. “Essentially, you want products with anti-inflammatory properties,” says Dr. Bank, such as Soothe. You can also try mixing Vitamin C for redness, with hyaluronic acid for extra moisturizing properties. Pure Emu Oil also has anti-inflammatory properties, as well as being soothing and moisturizing. If you want a great good-for-all-types mild moisturizer, try the Advanced Care Moisturizer which is perfume and dye free, and great for sensitive skin. “Some mild cases of rosacea respond very well to low doses of glycolic or salicylic acid, or mild skin peels, so a little individual experimentation can help you find out which works best for you,” says Dr. Bank. The Skin Regime’s 1-4-All Peel is layer-able (one layer being very mild, each additional layer adding strength) so you can discover which strength works best for you. *Platinum Skin Care recommends the Mandelic & Azelaic Peel 22 for Rosacea skin. What if your rosacea is more severe? “Even severe cases of rosacea can be treated very successfully,” assures Dr. Bank. “It will require a visit to a good cosmetic dermatologist, because severe cases require prescription products,” he adds. The prescription cream Retin-A, which also treats acne, has also been used successfully to treat rosacea. Also: “A course of antibiotics will sometimes help reduce the acne-like bumps that often come with rosacea, and we have modern lasers that are also very effective,” Dr. Bank says.